Expedia has some outstanding Tunis travel packages Bundling your bookings is a surefire way to save money and time — and get your adventure off to a great start. With more than 400 partner airlines and 321,000 properties to mix and match from on our global database, you won't have any problems creating your dream vacation. Don't worry about changing your group's travel plans, as we don't charge additional cancellation fees for almost all of our bookings. We have all the hot sightseeing tips for your impending trip to Tunis. Grab your travel diary and prepare to start filling up your itinerary. If you and your travel pals are looking for a place to get together and regroup, Carrefour Market is an ideal option. Chat over coffee and a snack and peruse the stores for that perfect keepsake. Visitors in this destination have heaps of options. History has much to teach us. Soak up the knowledge and become more familiar with times gone by at Bardo Museum. Still got time on your hands? Watch the live prayers, mingle with worshipers and appreciate the striking architecture of Zitouna Mosque. If you want to learn more, why not ask a few questions about local religious customs? Lock in a place to stay before you start organizing all your cool experiences in Tunis. Pick from the national capital's 62 Expedia options and you'll be one step closer to your next cheap vacation or luxury getaway. If you've got a bit of jet lag, there's nothing quite like relaxing in a posh room and dining on some room service. See what scrumptious treats await you at the Concorde Les Berges du Lac (Rue du Lac de Turkana) or the Sheraton Tunis Hotel (Avenue de La Ligue Arabe). Would you rather more low-cost accommodations? Have a look at the St Georges Tunis (16 Rue de Colognes) and the Dar Ya - Hostel (6 Impasse de la carriere). Have you booked your plane tickets for your trip to Tunis yet? 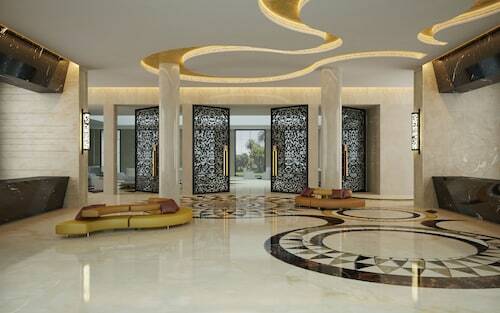 When you get there, prepare to stroll out into Tunis - Carthage International Airport (TUN). It's 4 miles (6 km) from here to the main streets of town. 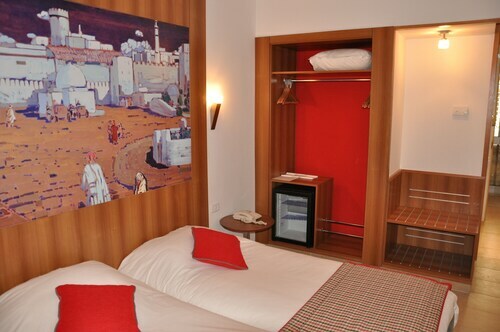 Located in Tunis Centre, this hotel is within a 5-minute walk of Habib Bourguiba Avenue, National Theatre of Tunisia, and Place du 14 janvier 2011. Maison de la Culture Ibn Khaldoun and French Embassy are also within 5 minutes. Palestine Metro Station is 29 minutes by foot. 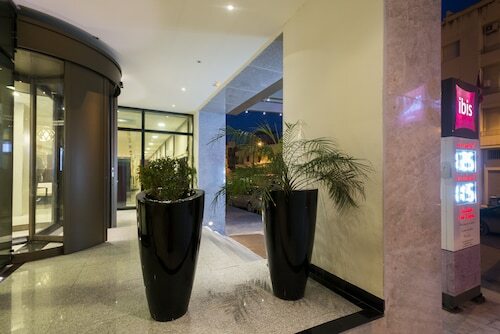 Located in Tunis Centre, this luxury hotel is steps from National Theatre of Tunisia and Habib Bourguiba Avenue. Carrefour Market is 1 mi (1.5 km) away. Nestled on the beach, this La Marsa hotel is within 6 mi (10 km) of Carthage Acropolium, St. Louis Cathedral, and Palais Ennejma Ezzahra. North Africa American Cemetery and Memorial and Museum Dar el-Annabi are also within 9 mi (15 km). Located in Ariana, this family-friendly aparthotel is 2.8 mi (4.6 km) from University of Tunis El Manar, and within 6 mi (10 km) of Tunis Zoo and Habib Bourguiba Avenue. Bardo Museum and French Embassy are also within 9 mi (15 km). 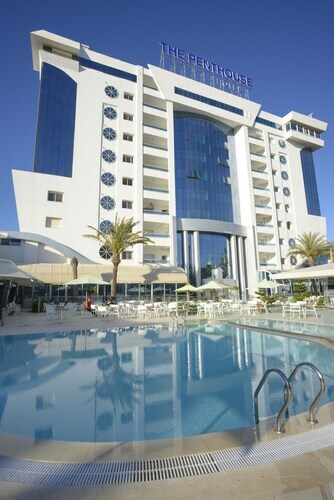 Offering direct access to the beach, this La Marsa hotel is next to a golf course and within 12 mi (20 km) of St. Louis Cathedral, Carthage Museum, and Tunisia Private University. 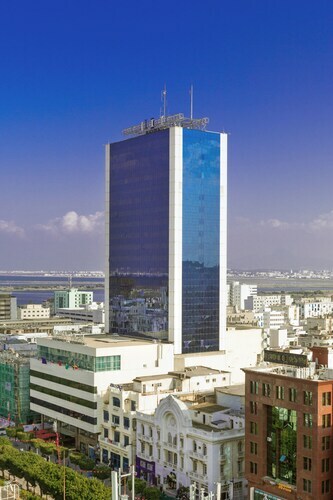 Carrefour Market and University of Tunis El Manar are also within 16 mi (25 km). Situated in La Marsa, this hotel is 0.1 mi (0.1 km) from La Marsa Soukra and within 9 mi (15 km) of La Marsa Beach and Carthage Acropolium. St. Louis Cathedral and Carthage Museum are also within 9 mi (15 km).